Eat by Zesty | How to Get Your Greens on St. Paddy's Day! 1. Fill ½ of your plate with greens. Does anyone remember the old food guide pyramid? If not, you’re not missing much, and if so, then check out the most recent guide to healthy eating created by Harvard School of Public Health. Filling most of the plate with greens (or any vegetables) packs your plate with nutrition. Having a hard time figuring out how to add vegetables to your plate? It can be a bit tricky if the options are meals like sandwiches, burritos or pizza. The registered dietitians at Zesty, an SF based catering company, always include a vegetable side with every meal program we plan for our clients. Salads are a great way to add variety, color and of course, greens, to the meal. Spice it up by adding nuts or seeds, flavorful dressings or a small amount of cheese to the salad and you might be surprised how delicious those greens can be! 2. Incorporate vegetables into snacks. 3. Sneak greens into smoothies. Add a handful of your favorite leafy greens to your smoothie! We love spinach because it is a great source of fiber, vitamins A and K, iron, calcium and vitamin C. These nutrients help boost energy levels and strengthen the immune system. Enjoy this green smoothie as an on the go office snack or a quick breakfast! 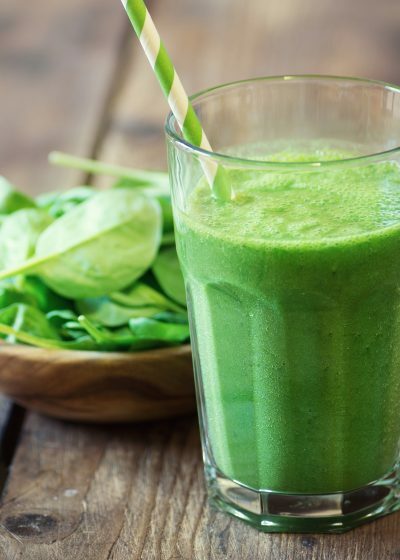 Blend spinach and almond milk until no leafy chunks remain.Add banana, pineapple and yogurt and blend until smooth. How will you be adding green to your plate this St. Patrick’s Day?